Berner Receives Patent For the HVAC Industry's Most Aerodynamically Efficient Electric Air Curtain Heater. Strategic positioning of the VTH Venturi-style electric heater offers up to 40-percent more aerodynamic efficiency by not obstructing air curtains' discharge or laminar air pattern. Berner International Corp., New Castle, Pa., the nation's leading air curtain manufacturer and innovator, has received a U.S. patent for a Venturi-style heater design that offers the HVAC industry's most aerodynamic, electric heated air curtain that improves air performance efficiencies by up to 40-percent versus other electric heating methods. Developed by Berner's David Johnson, engineering manager, and Phillip Thomas, project engineer, the VTH electric heater combines a hemispherical heating element array with an innovative mounting strategy at the blower inlet. Prior to the VTH's development, an air curtain industry standard was to place the heating elements on the intake of the cabinet or in the airstream of discharge, which causes a significantly inefficient disruption of the airstream's velocity, volume and uniformity (VVU). 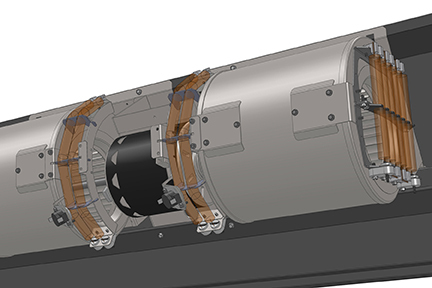 Instead, Berner's new patented design uses the Venturi effect to draw air through the heating elements and into the blower inlet before it enters the discharge airstream. Thus, the airstream discharge velocity remains unobstructed in a near 100-percent efficient heat transfer, laminar pattern of optimum aerodynamic performance that creates a near perfect environment-separating air seal across any open doorway while providing auxiliary heat, as needed. "The idea for the VTH wasn't an 'ah-ha' moment," said co-designer David Johnson. "Instead, it was the result of a steady progression that was developed over the last five years while we were researching other air curtain innovations." The VTH's innovative four-bolt mounting design is combined with quick-disconnect electrical terminals for easy maintenance or replacement accessibility within five minutes. Complementing the hemispherical design, the patent also covers a single plane heating element array that's mounted entirely across the blower's opposing inlet not obstructed by the blower or motor shaft. The VTH is available in Berner's industrial VS Series and In-Ceiling Mount Series air curtains. It comes in a range of 8kW to 70kW and voltages of 208V, 240V, 480V and 575V. Berner also offers optional natural gas, hot water or steam coils for air curtain heating. "In terms of energy savings and airstream efficiency, the VTH is a game-changer for the air curtain industry," said Georgia Berner, president, Berner International. Berner International Corporation is a 57-year-old U.S. manufacturer and a leader in the air door/air curtain equipment manufacturing industry. Berner is the first air curtain manufacturer to offer its product line in building information modeling (BIM). Berner is a member of the U.S. Green Building Council (USGBC), The Green Building Alliance (GBA), the Air Movement & Control Association (AMCA), the American Society of Heating, Refrigerating & Air Conditioning Engineers (ASHRAE) and also a certified Women’s Business Enterprise National Council member (WBENC). For more information on Berner and its products, please call (724)-658-3551 x403 or visit www.berner.com.